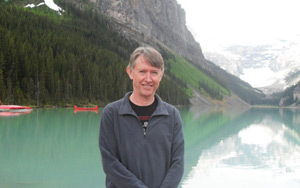 Pannell Discussions » Policy » Ideas in economics, environment, policy and more. In February I spent two weeks on holiday in the north of India, visiting Delhi, Agra, Jaipur and Jodhpur. For many years, I had been reluctant to go there, afraid of being overwhelmed by the culture shock and the poverty. In the end, there was plenty of both, but perhaps less than I expected, and I really enjoyed the visit. Here are some quick impressions about some of the main things that stood out to me. There is plenty of evidence that India is developing rapidly. Between 1980 and 2014 its Human Development Index increased by 68 percent, and its Gross National Income per capita (in constant dollar terms) increased from $1255 to $5497. Their economy is continuing to grow rapidly: at 7.6% (real) in 2016. Still, there are many people doing it very tough – e.g. sleeping under overpasses or in train stations. There was more begging on the street or at traffic lights than I had previously encountered elsewhere. On the other hand, there was less of that than I expected. We were able to give to many of the beggars we encountered without feeling like it was overwhelming. The huge majority of people look like they are doing OK. And there are plenty of people who are clearly doing very well indeed. The population of India is 1.27 billion, and it’s growing at 1.19% (15 million people) per year. It will overtake China as the world’s most populous country in about 2022. Sometimes in Delhi it feels like they are all on the streets! 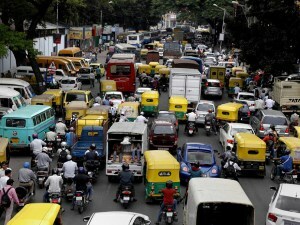 Indian traffic is like nothing else I’ve ever encountered. Countless millions of cars, tuk tuks, motorbikes, trishaws, and sometimes buses and trucks. Not to mention cows and pedestrians. The congestion is absolutely terrible of course, but just as remarkable is the way the traffic works. It feels like one is in a school of fish rather than a flow of traffic. Lanes are completely ignored. One moves forward into any available gap, seemingly no matter how narrow it is. When roads intersect, the cars just sort of inter-mesh and weave their ways through. You can’t wait for a break in the traffic before you cross, because there will never be one. I never got used to the alarming way that our drivers turned left onto roads or into roundabouts – they just drive on, seemingly without even looking whether there is room for them. The traffic just has to make room. People are also quite relaxed about driving into oncoming traffic if doing so would be convenient. Our own drivers did it several times, and we once encountered a large truck coming straight at us in our lane: the inside lane of a dual carriageway road! Pauline screamed, but our driver was quite unruffled. He just shuffled to the left as if it wasn’t surprising. Because it wasn’t. Apart from the traffic, it can be pretty crowded for people as well. Walking through the market area in Old Delhi it sometimes seemed about as crowded as being inside a bus in peak hour in Perth, but we were in the open. Crowding was most intense inside some of the vehicles. I was part of a group of three, and we felt quite packed in in the back of a tuk tuk, but I saw plenty of tuk tuks with about eight passengers and one that surely had more than 10. It was common to see three passengers in the front with the driver, and he only has a single seat. 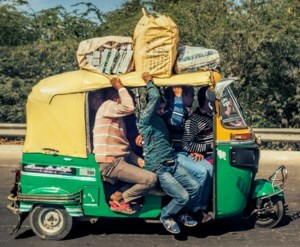 One person would often be sitting under the driver, the other two teetering on a few inches of seat on each side. On the other hand, we did manage to find plenty of relatively uncrowded places too, particularly some nice parks. The crowds are intense but not continuous. I’ve never seen so many different types of animals in urban areas: cows (of course), dogs, camels, horses, donkeys and monkeys are commonplace, and in Jaipur there are elephants. I witnessed a pitched battle between rival monkey gangs near the Taj Mahal. Delhi is famous for its poor air quality. According to the World Health Organisation, Delhi has the worst air quality of any major city in the world. I had previously visited Beijing and experienced its appalling air quality, but Delhi is 43% worse (in terms of fine particles, which are the most damaging to health). Fortunately it wasn’t too terrible while we were there, but on average air pollution kills about 1.5 million Indians per year – their fifth highest cause of death. There is increasing awareness of the problem, but they’ve got a long way to go. For example, burning rubbish (including plastics) in the streets is still common. The other local environmental issue that stood out was garbage in the streets. Particularly in Delhi and Agra, the garbage situation is absolutely woeful. Jaipur and Jodhpur were much better, apparently due to official efforts to raise awareness and clean things up. They are also much better for air pollution. 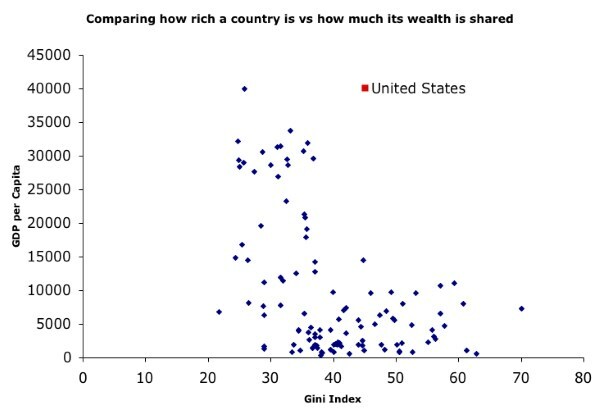 Hopefully, rising incomes will result in people in other cities wanting to follow the examples of those two. With so many people to fit in, you have to go looking for relatively natural areas. 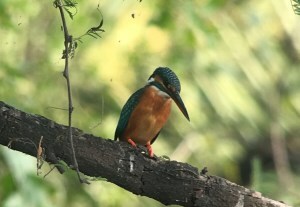 We went to Keoladeo National Park south of Agra, and it was absolutely fantastic. The range of birds, especially water birds, was just amazing, and there are plenty of other animals as well. We saw jackals, mongooses, deer, antelopes and bats. Highly recommended. I’m completely hopeless at haggling. When buying small items, my heart is not in it, because fundamentally I am quite happy not to pay the lowest possible price, on the basis that it is still cheaper than I’d be happy to pay in Australia, and these people need the money more than I do. Add to that the fact that Indian sellers are masterful and incredibly persistent persuaders, and you can see the risks I faced. Oh well, it was an experience. I’ve always wanted 12 crudely hand painted plastic elephant key rings. I love Indian food. There were lots of great dishes you never see at an Indian restaurant in Australia. I used to always get really sick in developing countries, but over time I’ve developed a relatively effective strategy: carry hand wash and use it regularly, be cautious when choosing where to eat, and take Travelan before each meal. (And of course only drink bottled water.) I’ve now used this approach in Indonesia, Vietnam and India without getting a single serious stomach problem. In India I added another element to the strategy: only eat cooked vegetarian food. This was no hardship at all, given how good their vege food is. We read a bunch of horror stories about the dangers before we went there, but never felt in any danger (apart from on the roads). Our guides warned us a lot about pickpockets, but we kept our valuables in pickpocket-proof bags, with metal reinforcing, so felt safe. Overall, it was a great experience. Despite the various challenges, I’m really glad I went. 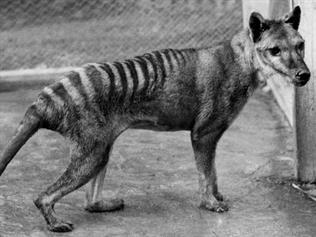 295 – What is a threatened species worth? There are around 1800 species included on Australia’s national list of threatened species of fauna and flora. The most severely threatened category, “critically endangered”, includes 6 mammals, 16 birds, 8 fish, 9 reptiles, 5 frogs, 25 other animals and 148 plants. My feeling is that the general public is more concerned about threatened species than about many other environmental issues. There is something horrifying about the thought of extinction that resonates with most people to some extent. Nevertheless, our performance at improving the status of threatened species is generally poor, in part because of a lack of funding available to address the problems. Researchers have attempted to measure the level of public concern about threatened species in a variety of ways. Economists have most often measured it using surveys to elicit people’s willingness to pay to protect a species, or their willingness to trade-off species protection against other benefits that they care about. Literature on non-market valuation (NMV) of threated species and threatened ecological communities was collated and reviewed. We reviewed 76 papers, of which seven were from Australia. There is strong evidence that the broader community does support and is willing to pay for protection and recovery of threatened species. In many cases, the estimated non-market values far exceed the expenditure that would be required to protect or recover the species. However, there are significant gaps in the literature, particularly for threatened reptiles, plants, insects and non-charismatic species. There are no NMV studies of threatened ecological communities. We identify cases where evidence about non-market values has had a notable impact on the management or funding of threatened species. There are many such cases. However, overall utilisation of NMVs in decision making about threatened species is low and there is great potential for benefits if its utilisation is increased. Barriers inhibiting such an increase include lack of awareness of economics in relevant organisations, lack of existing economics capacity in those organisations, the limited volume of existing evidence about NMVs for threatened species and ecological communities, and a lack of time and resources to undertake economic analysis. We make suggestions for future directions for research and capacity-building. Pandit, R., Subroy, V., Garnett, S.T., Zander, K.K. and Pannell, D. 2015. A review of non-market valuation studies of threatened species and ecological communities. Report to the National Environmental Science Programme, Department of the Environment, Canberra. 18 December 2015. Full report here. In some countries, tolls are collected on particular roads or bridges. I recently saw a remarkable example, with a fascinating history, near Oxford. Last week I completed a 180 km walk along the bank of the River Thames in England. It was absolutely gorgeous, with numerous points of beauty, lots of great historical stuff to look at, and some surprises. 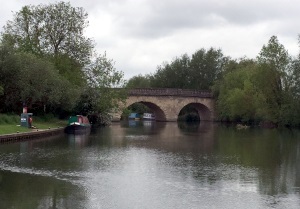 One of the surprises was the Swinford Toll Bridge, near the town of Eynsham, just upriver from Oxford. A small toll booth collects 5p (about 10 cents) from each car that crosses the bridge. Tolls have been collected here since the bridge was opened in 1769. It hardly seems like it would be worth the bother of collecting 5p, but there is plenty of traffic crossing the bridge, so it collects around £200,000 per year. Clearly, the charging of tolls is not a new thing. In fact, there were a lot of toll roads and toll bridges in England in the 18th and 19th centuries. According to the World Bank, most countries currently have no tolls, but tolls do continue to be created and/or maintained in some countries, including Australia. There are various possible rationales for imposing tolls, including the following. To generate revenue for the government, allowing reductions in other taxes. To charge actual users of the road or bridge (consistent with a “user pays” philosophy), reducing the burden on taxpayers who happen not to use it. To discourage use of the road or bridge by creating a price for its use. This may help to reduce a problem, such as congestion or noise, by encouraging use of public transport or use of different routes. To encourage private-sector funding of infrastructure by allowing the funder to recover their costs through charging a toll. 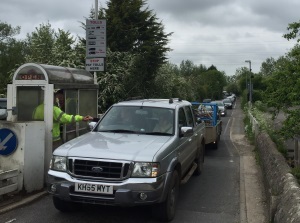 In the case of the Swinford Toll Bridge, it was that last rationale that led to the toll. 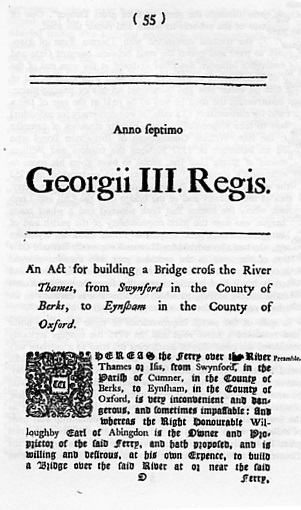 In the mid 1700’s there was a desperate need for a good bridge in the area, particularly to allow farmers to deliver their produce to Oxford for sale. The government was not forthcoming with funds, and taxing the local community to collect funds to pay for construction of a new bridge was specifically ruled out by a clause in the Magna Carta! To the rescue came the Earl of Abingdon, who agreed to pay for construction of the bridge. He had more than one motivation for putting up the funds. One was that he owned farm land in the area and would benefit himself from better access to the Oxford market. Ownership of the bridge and its tolls to be passed to his heirs and to continue forever. What a deal! This was all enshrined in an act of parliament, which is still in operation. Some things have changed since 1769. The toll has gone up in nominal terms (without adjusting for inflation) but fallen in real terms (allowing for inflation), pedestrians no longer have to pay it, and the Earl’s descendants sold the bridge to an investor. I’m not sure how many times it has changed hands, but most recently it was sold for over £1 million in 2009. Other than that, things carry on essentially unchanged for this beautiful bridge with its quaint toll. Not surprisingly, some of the local residents are not happy about it. It was immediately obvious to me that paying the toll results in long queues leading up to the bridge, especially at peak times. The resulting frustration, loss of time and the cost of petrol consumed while queuing would be far more significant to local people than the need to pay a tiny toll. For over a century, locals have been trying to get rid of the toll. When the bridge was for sale in 2009, they wanted the Oxfordshire County Council to buy it and abolish the tolls, but this didn’t happen. It may be a long time before there is another opportunity. It seems to me that the original reason for allowing private ownership of the bridge was OK, but that the conditions offered were too generous and too permanent. Conditions have changed greatly since the act of parliament (cars! 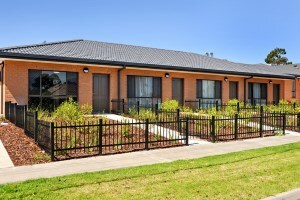 ), resulting in large unanticipated costs to the current community. It’s always difficult to anticipate what costs a new law or regulation might generate, especially 250 years in the future.